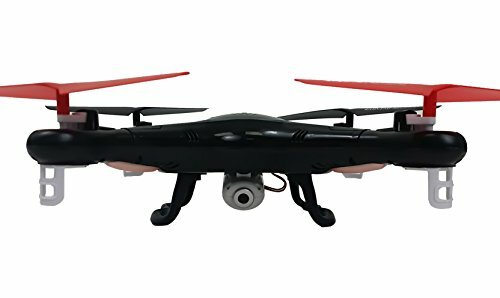 Very affordable drone model, easy to fly with simple controls and plenty of power to handle easy wind conditions and on top of all of that, it has a 720p HD camera. Stable enough to fly indoors or outside. Spending a lot of money on a camera drone may be hard to swallow, particularly if you are just looking to have a nice time flying around your backyard. That’s what makes the Syma X5C so amazing. At about $50 you get a simple camera quadcopter with enough power to handle light winds and easy controls. 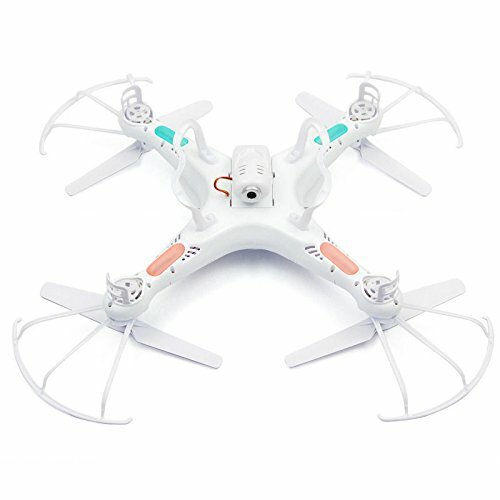 The Syma X5C is a quadcopter that is simple to operate, making it the perfect drone for novices. It is equipped with a high degree HD camera. If you are interested in photography, Syma X5C will enable you to take amazing photographs once you learn how to operate it. A key 360o roll, continuous roll for perfect action and wonderful performance. Mode 1 and 2 options .specifications and colors of contents may vary from photo. Comes with bonus stock battery (3.7v 500 mah) for longer flight time! Total of 2 batteries! It is a upgraded version of X5C equipped with HD Camera.Please know that the "X" of X5C on the plane is red. Build-in 6 axis gyroscope for precise hovering in the sky. Various control options for those piloting the X5C. Up, Down, Left, Right, Forward, Backward, Leftward flight, Rightward flight. It comes with a 6-Axis Gyroscope which allows for precise hovering and strong balance in the air. The Spread Spectrum Control allows for greater duration, responsiveness and flight distance. 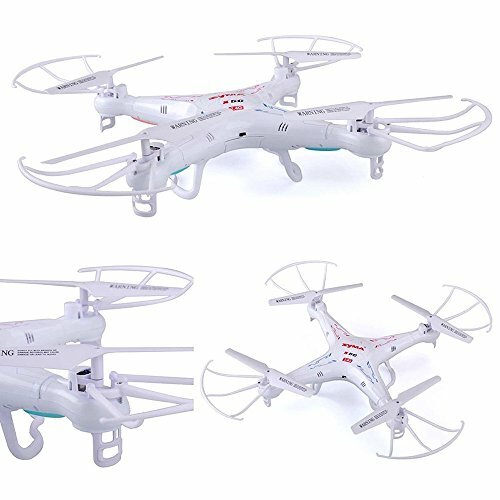 For beginners there is a 360 Degree Eversion control that allows this quadcopter to roll constantly without affecting control. This quadcopter has a 2MP 720 HD camera for taking amazing videos and pictures from the air. The videos might come out a bit shaky on windy days, but when the weather is calm, it is possible to get smooth video. Also, during a nice scene, you can freeze a recorded video to get a snapshot. Syma X5C even comes with a 2GB microSD card for storage. If you prefer flying at night, this quadcopter also comes with orange and green lights that help you see it at night and keep you oriented. 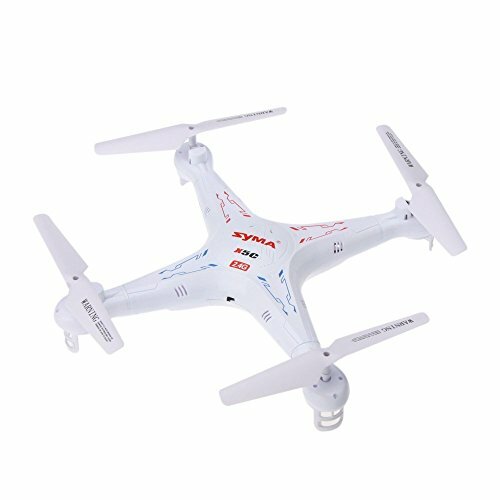 Syma X5C is quite durable, so if you are a beginner at operating a quadcopter it can take a lot of punishment. However, if motor burns out or you break something, Syma has made every part available for replacement. Also, the included print manual has a diagram for ho to break it down. If you lose the instructions, you can simply find the Syma X5C user manual online. You can also purchase an updated camera with Wi-Fi to give you a FPV (first-person view) from the camera to your Android or iOS device. 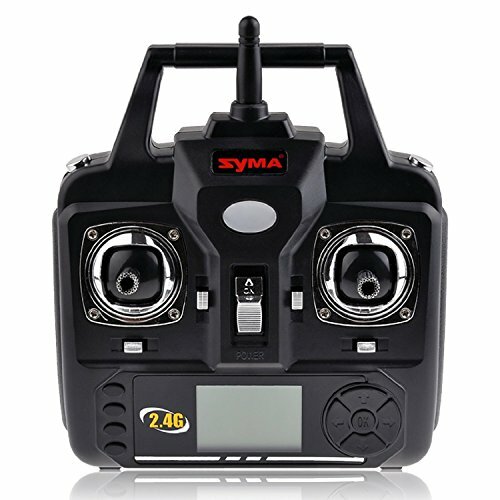 Syma X5C can be flown both outdoors and indoors. However, if you fly this quadcopter outdoors you have to be cautious not to lose it. Flying time with the remote is about 8 minutes, with the stock batteries, though removing the landing gear and prop guards and detaching the camera will get you a couple of minutes more. For that reason, it is recommended to either buy a recharger that allows you to reuse batteries, or buy extra batteries. 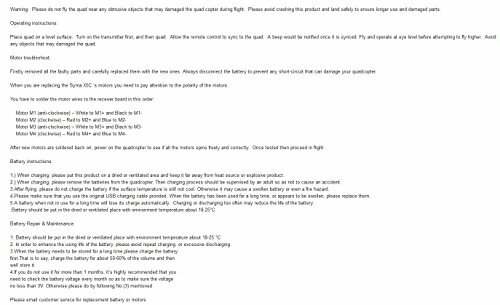 The battery of the quadcopter is a 3.7V 500mAH Li-poly. Syma X5C comes with a USB cable that allows you to charge the quadcopter. It takes around an hour and a half to charge the batteries with the USB charger. Not only does the package contain a USB cable, an instruction manual, and stock batteries, but it also contains a remote control, a screwdriver, and main blades. This quadcopter focuses on really doing a couple things right. Syma X5C flies best in light to moderate wind conditions. It gets some extra manoeuvrability when the blade guards and camera are removed. If design itself can be regarded a feature, Syma X5C earns marks for keeping itself elegantly simple. 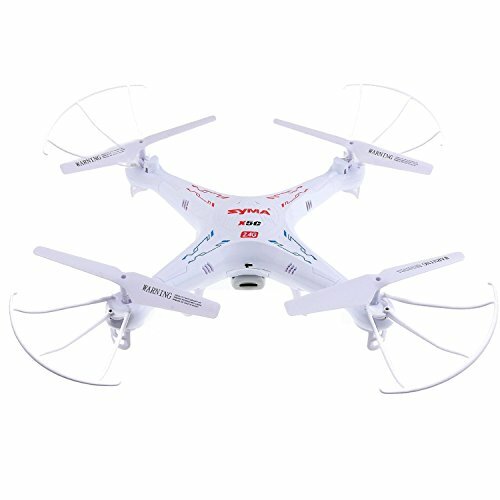 Syma X5C is an inexpensive quadcopter, bit it looks really nice. More importantly, this quadcopter looks nice while packing some important capabilities in the air. The only problem with using Syma X5C at its full range during the day is that its LED lights are hardly noticeably. This is why additional precautions, like a strip of colored tape, may be needed to keep oriented at long range during the daytime. Syma X5C has a 2MP 720 HD camera. The camera takes good quality photographs most of the time and is moderately stable. The camera also comes with a 2GB micro SD card for easy transfer from the quadcopter to personal storage. The Syma X5C’s controller places more focus on controlling the flight than it does on the camera. The camera is fixed in one direction, overall focus and zoom. While the camera can be removed it can’t be placed to other locations on the quadcopter. Generally, the Syma X5C camera performs as published, no less and no more. The dimensions of the Syma X5C are 12.2 x 12.2 x 3.1 inches. This quadcopter is around 2 pounds, making it pretty light for a drone. 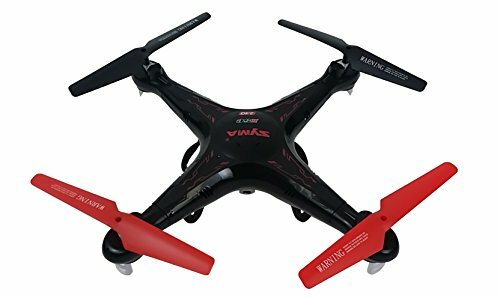 While the Syma X5C is really a toy, it looks exactly like a drone. It is recommended to be careful about flying it over neighbours’ properties. 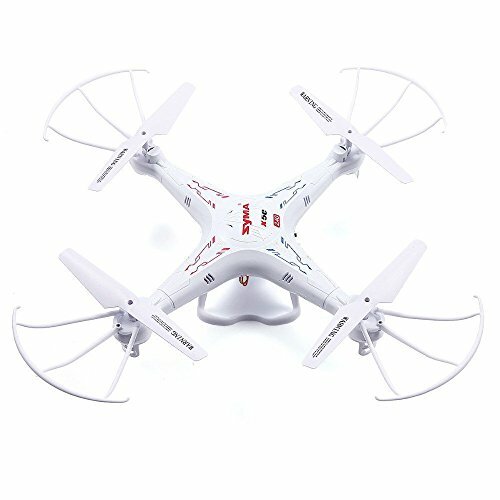 This quadcopter is white and this can be helpful in case you lose it outside. It has flashing colorful lights. 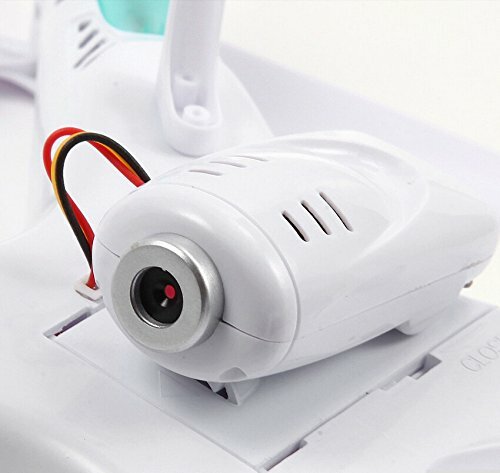 This can be useful to fly the quadcopter even at night-time. Luckily, as long you are cautious while using this quadcopter, you shouldn’t lose it very often. You fly it with a remote control and Syma X5C can fly up to 50 meters being controlled with the remote. One advantage of this quadcopter is that is very stable in calm, windless conditions if you set the trims correctly. The package contains blades you can add to the quadcopter to serve as a protective guard. That way, if this quadcopter falls from a high altitude, the possibility for injury is reduced. This quadcopter is ideal for novices because it is so simple to control and fly with great precision. If you have never operated a drone in your life before, you can operate the Syma X5C like a professional with only hours of practice. While LED lights don’t serve any function during the day they will help you with directionality during the night. 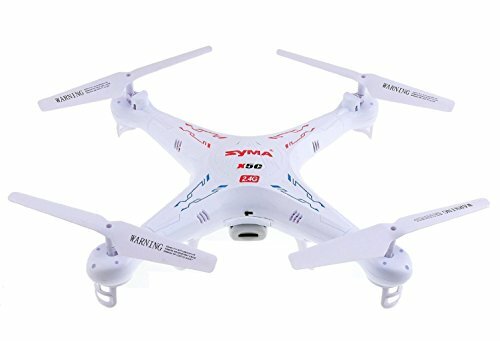 If you are concerned about the propeller blades of your quadcopter breaking, the Syma X5C comes with four replacements. You can purchase more replacements online if these four aren’t enough. The battery life of this quadcopter is pretty decent, especially when comparing to battery life of other quadcopters. Depending on different conditions, the batteries will last you approximately 10 minutes between charges. The quality of the camera is an enormous con of this quadcopter. The X5C’s camera is 2 MP, which is a very low resolution. The speed of the camera is 30 frames in one second and the pixel resolution of the camera is 1280 x 720 pixels. The data rate is 1.5MBps. Consequently, although the camera is HD, the quality is not great. In the air, this quadcopter is responsive and elegant. The spread spectrum system of controls does a respectable job preserving the life of battery, and the Syma X5C can stay in the air for about 10 minutes or longer with the stock battery if used properly. This quadcopter is quite light-weight, particularly without the guards or camera, so it is not perfect on a windy day. However, it flies beautifully in calmer conditions. Syma X5C is fast, small and can get back up after a hit in the event of a crash. 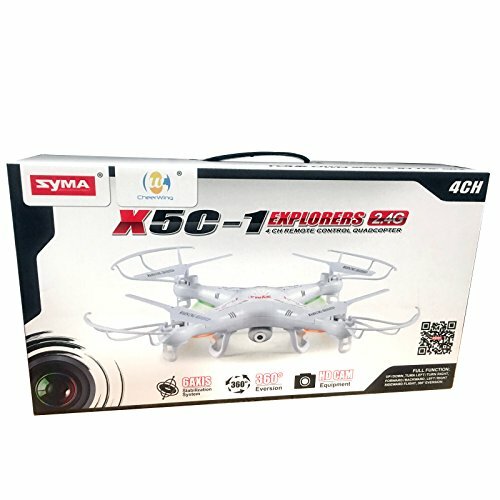 For beginner fliers, this is an extremely helpful quality, and one that Syma X5C delivers well. along with an extra four USB battery charger in order to be able to use this quadcopter for longer periods of time.
. That way you can easily use it at the park. Syma X5C is certainly one of the best quadcopters for new aerialists to enjoy, and is excellent for casual use by more experienced fliers. The price is very low for a quadcopter, but the value and quality you get from the product is unbelievable. 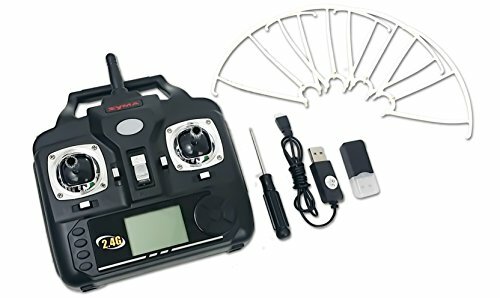 Most people who only want a new quadcopter for recreational use will never need another flying gadget in their lives, but Syma X5C is also good for RC hobbyist of many years.